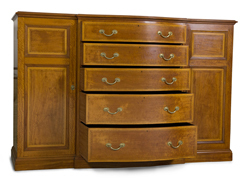 Peter J. Martin & Son are a long-established family firm of antique furniture dealers. Whether you are looking for a table, sideboard, or chairs for the dining room, a wardrobe, bedside cabinet, chest of drawers, or mirror for the bedroom, or even a desk or bookcase for your library or office, we’re sure we’ll be able to help you. We always have a selection of display cabinets, seat furniture, miscellaneous occasional furniture, and decorative items available too. All these are available in a range of different kinds of wood: mahogany, walnut, oak, rosewood, satinwood, and other exotic timbers. We hope you enjoy browsing through our website, and that you’ll get in touch if you have any queries. We look forward to being of service to you.